This appeared last week according to the Dota 2 store date, but it's worth highlighting in case you missed it. Justin Roiland and Dan Harmon's animated TV comedy duo now have a Dota 2 voice pack. 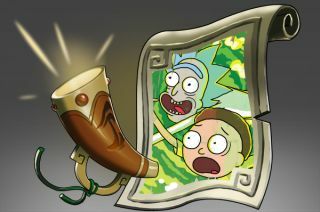 Rick and Morty banter, voiced by Roiland, replaces general announcements and megakill announcements and can be bought from the in-game store for $7.99. It was added to Steam for voting a couple of months ago with the above teaser video. The Mr Meeseeks courier has yet to receive enough support to make it into the main game. Poor li'l guy. Couriers and cosmetics can struggle to pass Valve's art rules (which might be why Mr. Meeseeks hasn't made the cut). Voice packs are a really neat way of bringing bits of pop culture into Dota, though. What next, Bojack Horseman?